Looking for a Plumber, Gasfitter or Drainlayer whom provides a high-quality service? 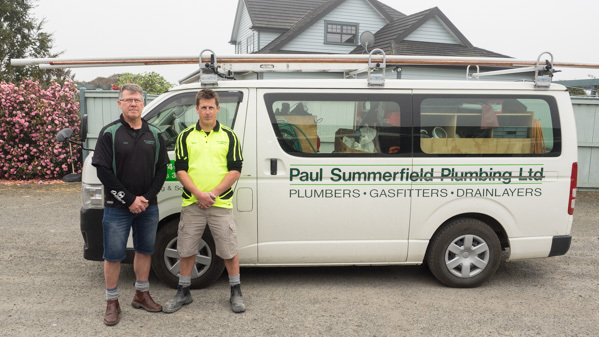 Then call the team at Paul Summerfield Plumbing (2006) Ltd, we are a locally owned family business based in Ashburton. At Paul Summerfield Plumbing (2006) Ltd, we can take care of all your plumbing, drainage and gas fitting needs. With over 44 years’ experience in the industry (along with employing 14 staff, with 9 vans on the road, a truck and 4.8ton excavator) we are experienced and qualified Master Plumbers, delivering the highest standard of quality workmanship and efficient service. Let our skilled team help you with all your domestic and commercial plumbing, drainlaying and gas fitting requirements. Our dedicated plumbers have had extensive experience working with numerous housing companies, commercial companies and architects to provide plumbing services. We are Site Safe accredited and undertake both new projects and maintenance work. We devote our staff to work in specific projects from inception until completion, that ensures consistency and great outcomes for all involved. Our number one aim is to provide our customers with efficient and professional workmanship. All work is guaranteed so call now for prompt, friendly service and a speedy solution to your plumbing and gas fitting issues or to arrange free quote.